If there’s one thing about the two of us, it’s that we absolutely LOVE to use and create with things that would otherwise be tossed aside. 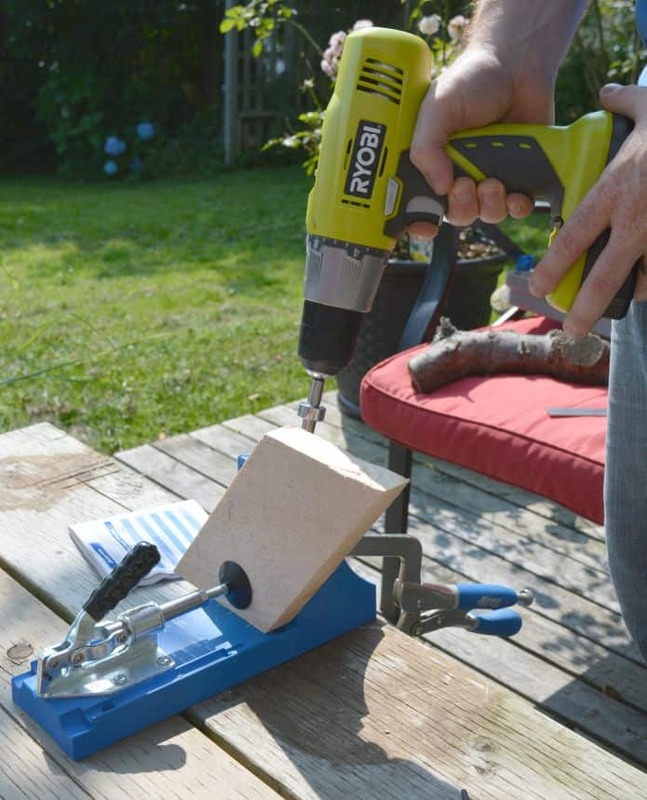 Our friends over at Ryobi power tools were kind enough suggest we band together to do a wood working project – so this seemed like the perfect time. (Hey! 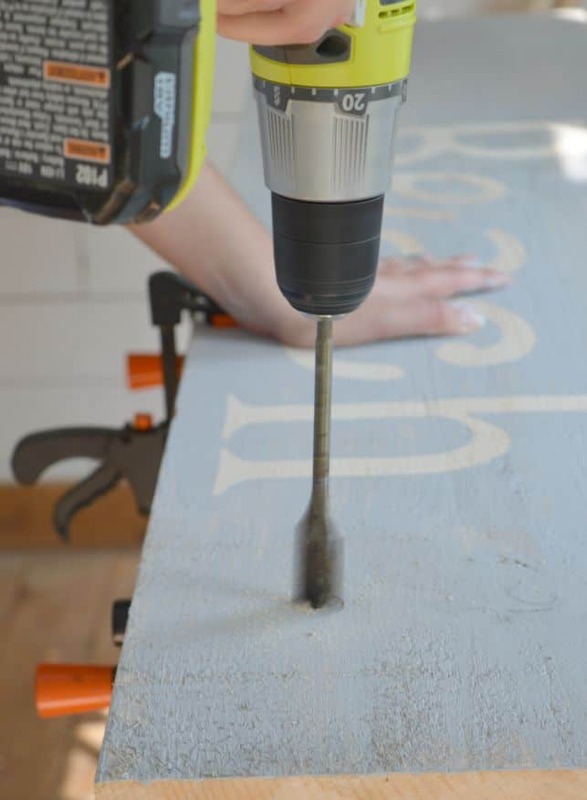 And you can follow along all over social media with the hashtag #RyobiDays! ) AND – you can check out all these other bloggers and their projects too! We raided our scrap wood and lumber pile in our shed and both pulled out pieces of wood we liked; some new, some old, some reclaimed, some painted – as well as little bits and bobs we thought we could use. 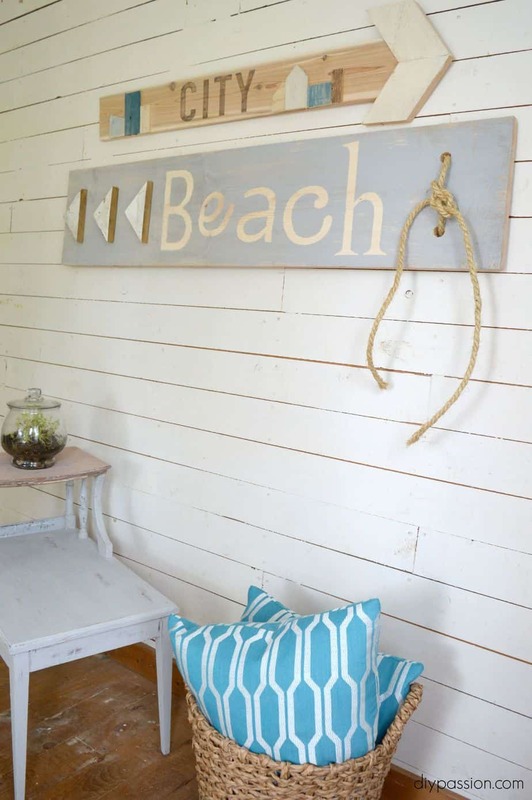 Erin’s Project: The Girly Beachy Sign! The biggest board I wanted to use was 8 feet long by 12 inches wide – ideal for a giant chunky (and beachy sign) – but it needed to be cut. I was totally worried that I would be wobbly, but nope! 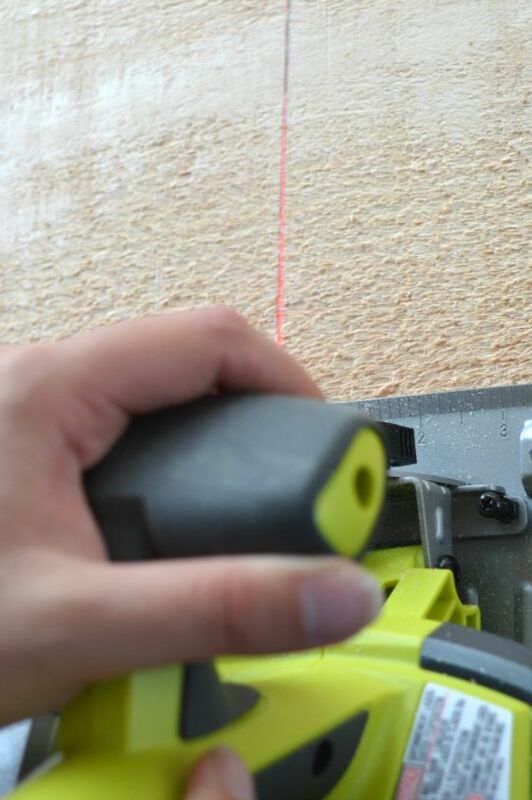 There’s even a super neat laser on the circular saw to follow along as you cut to make sure your line stays straight. Once the board was cut to size (it’s around 5 feet long now), it had to be sanded, given a rough coat with Minwax Wood Conditioner (it stinks! but it works! 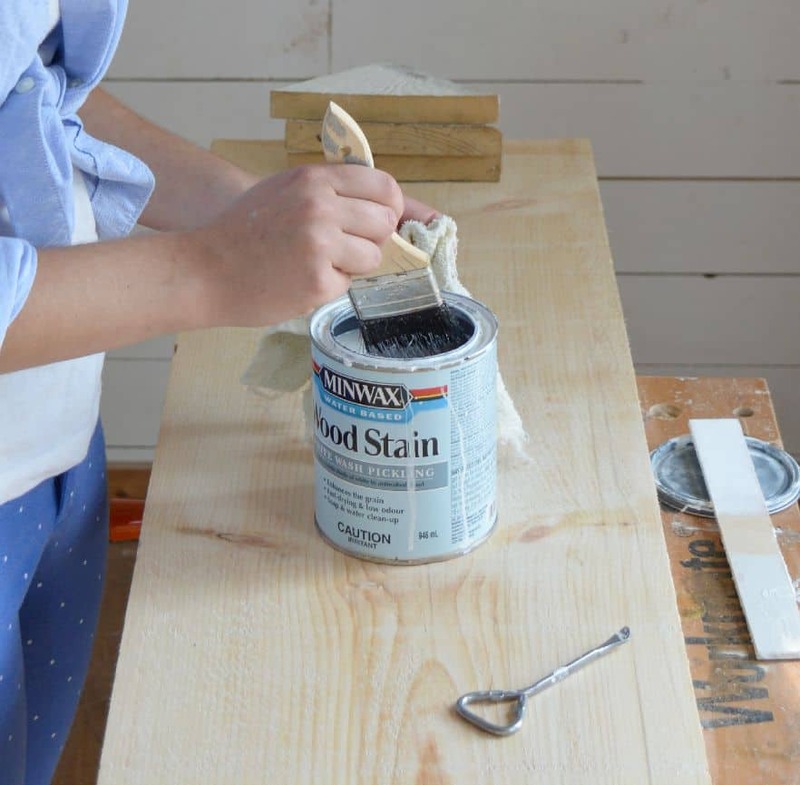 haha – so use it in a well ventilated area) and that was followed by another light coat of Minwax Pickling Whitewash stain. As it was curing, I whipped up some giant vinyl letters using my Silhouette Cameo. 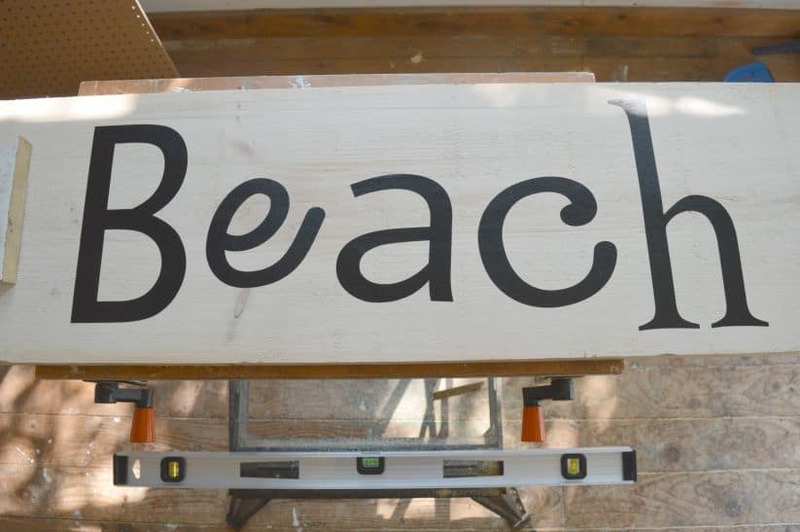 I created the word BEACH. Then I used a mixture of grey chalk paint and water to go over the whole thing. 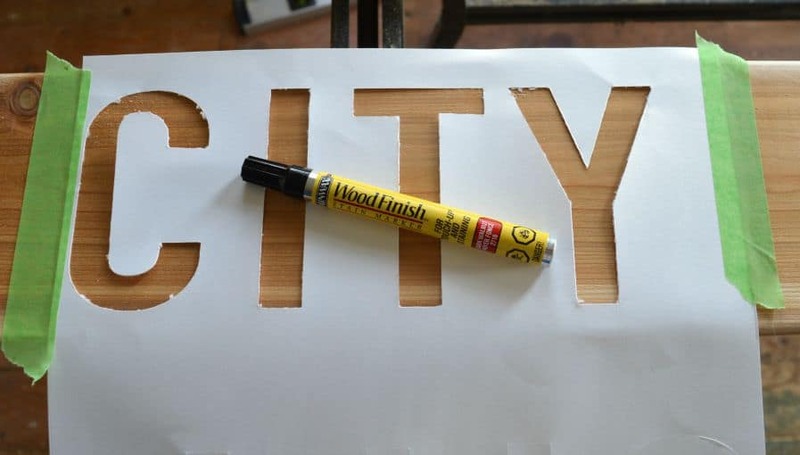 Dan’s Project: The City Sign! My task was to build a sign inspired by a city aesthetic. I took a similar approach to Erin and opted for a basic plank, and some spare scraps for embellishments. 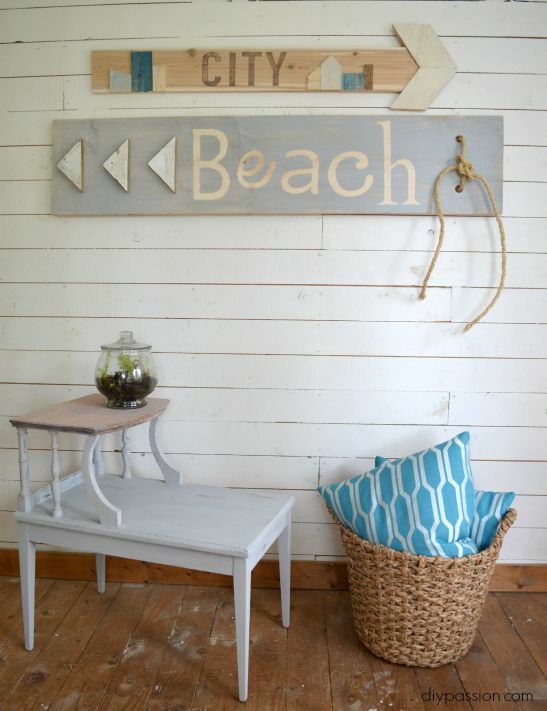 I wanted the sign to echo Erin’s beach sign in its weatherworn look, but also stand apart as something starker. All told, I too used Ryobi’s circular saw, drill and Air Striker nail gun, along with some carpenter’s glue and a kreg jig. I used the circular saw for a simple straight cut, and for some more involved angled cuts. A straight cut brought my plank to the desired length, and the angled cuts were necessary for creating a chevron that serves as the sign’s arrow head. The guiding laser came in particularly handy and ensured I stayed true with my cuts. I then paired the cordless drill with a kreg jig to join the two pieces that form the chevron. (and because everything was cordless, I was able to do so outside, on a beautiful sunny afternoon… ahhhhh) Speaking of outside – notice that our jungle-like backyard isn’t AS jungle like? That’s because we’ve also got a set of Ryobi lawn care tools to help us with that. We have the mower, trimmer and the leaf blower – all of them have the interchangeable battery system too. So if you’re in the market, definitely check them out. I cheated a little bit next, and asked Erin to create a stencil for the lettering. I used a stain marker with the stencil to make the letters, and then coated everything with a quick pass of whitewash stain. Lastly, we cut some scraps of leftover wood to create “skyscrapers” for the sign, painted them with some leftover paint (in convenient shades of city blues, whites and greys), and tacked them on with the nail gun. (Erin helped with this part. She’s better at paint than I am.) All told, this was easy as pie. Delicious, summery pie. And here is our finished product! Eventually, these will hang under the window in the rec room and they will actually point in the right direction! This project was challenging only because it required us to use our creativity pretty much every step of the way. But because we used items we had on hand, and up-cycled what would otherwise have gone into the trash heap – they cost us next to nothing and pack a big design punch. Please note: We were compensated for today’s blog post and project. This post contains affiliate links – for our full disclosure policy, see here. I would build a sofa table for my family room. 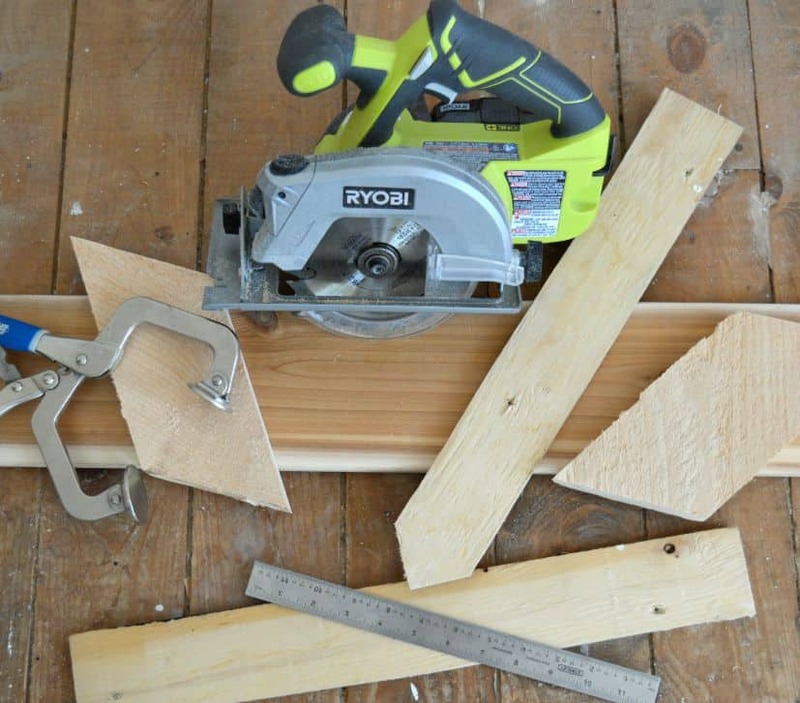 My children and I would use the Ryobi One+ to make excellent gifts for Christmas. Your signs are super cute! I love the little buildings on the city sign. Thanks for the great giveaway too! These signs are great!! So much more personalized than the expensive ones you can buy in stores! If I were to win this awesome prize package, I would help my husband make some really cool planters for our orchids! 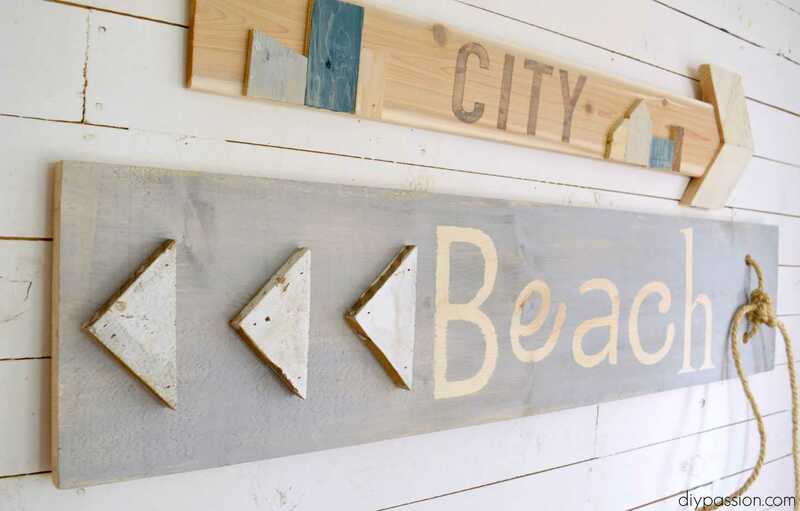 Love the signs, The beach one is my favorite. 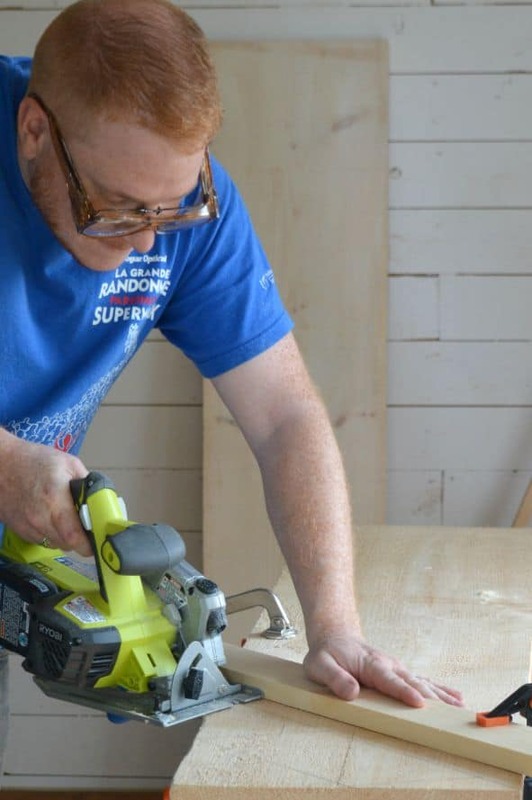 The right tools sure make a project easier. I totally LOVE these signs!! It inspires me to make some for my own place ‘at the shore’ and as soon as we are back there next week, I will rummage through our shed to see what we have. Really, very nice! This prize pack would be gifted to my husband. He’s been getting into wood working. He’s making a desk right now and he has plans for a kitchen table. Thanks for the giveaway! These signs turned out so fun! I love the rope detail on yours. Good on you for using scrap materials too. Love these signs! My job allows me to bring projects with and get crafty, what better way than with this pack of awesome tools! So many things to build/repair and so little tools! 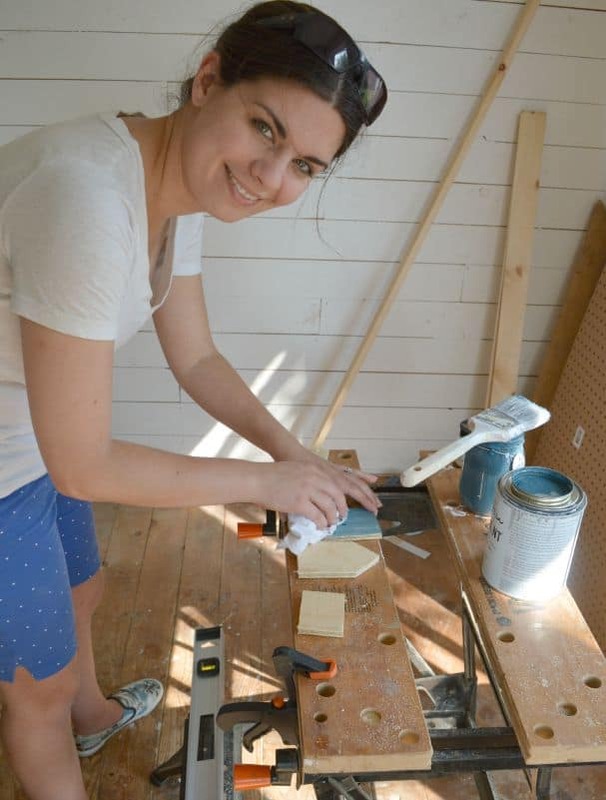 We need to tackle a hole in the shed and some railing issues for starters and I’d like to build some furniture! Love your signs, what great inspiration. Thanks for sharing all you do, and for the contest! I love how these turned out and what a fun idea to do his and her projects! You guys both did great! Everything! But seriously, I’m at least planning on building shelves, possibly Ana White’s Simple Bed, and a table for the new house. This would be a blessing! What a fun idea!! Love the little city buildings. Having awesome tools to work with makes the job so much easier! These are SO super cute you two! LOVE! Would love to win that amazing prize pack as we start renovating our Kitchen next month!!! You do have a lucky streak going 😉 Good luck Bre! Your signs are so fun! Love projects made with leftovers, especially when they turn out this good. We are ALL about the leftovers! It’s such a fun challenge!! 🙂 Thanks Shauna. I love following your Blog…you are an inspiration! You give me courage to do things myself. All I need are some new tools and encouragement! Those signs are awesome! You guys did a great job! I’d love to make some book shelves for the baby room! I would love to cut some wood. VRROOOOM VROOOM. Or what ever sound power tools make. Thanks for such a cool idea! Love the signs. You guys did a wonderful job! So cool! 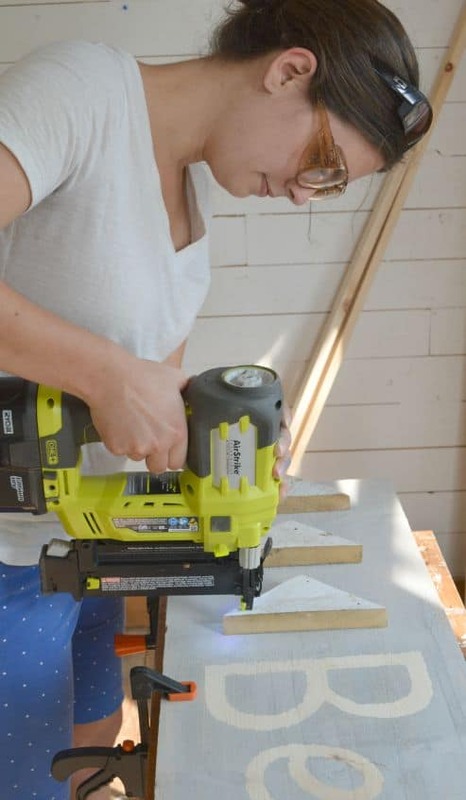 I would love to get over my fear of power tools and make some rad stuff! I am currently finishing my basement and remodeling two rooms upstairs. The list of things to do is endless so new tools would be wonderful. Love the signs. Great use of the leftover wood pieces we all have handing around the shop! Love these Erin!!! They go together so well which is so cool for a his & hers challenge. 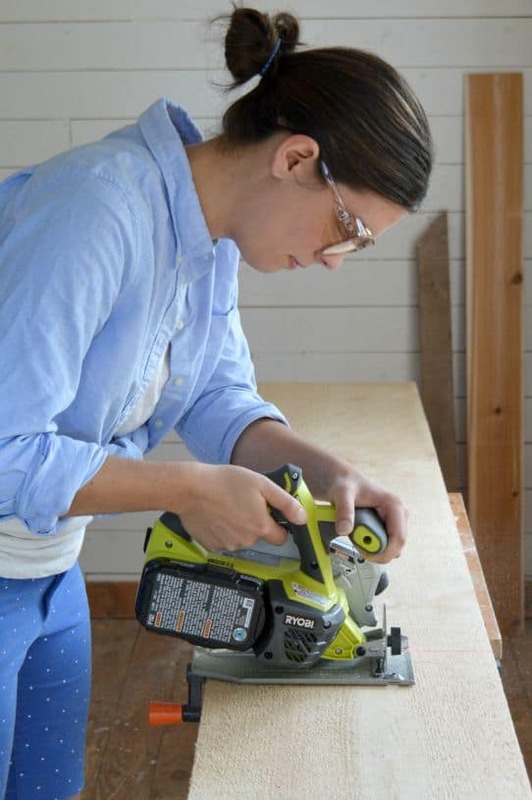 My husband isn’t allowed to use my power tools though 😉 I’d love to have a full Ryobi arsenal to help build the outdoor dining table I’m planning . Thanks for the great giveaway!! I would use the tools to build a few raised garden beds, maybe a mini hoop green house, and shelving for the basement,! These signs are great! Love the arrow! I love these! Especially the arrow! I love the way you made the signs 3d by attaching the cut out shapes. Very cool. I’m an avid DIYer, from fixing minor plumbing issues to making homemade Halloween Gravestones (this years fall project) to scare the neighbors for Halloween this year so this combo pack (especially the nailer) would be HUGE for me! What wouldn’t I build? Haha! I’ve always wanted to build a side table, so maybe that would be my first project. I love how your arrows turned out and I can’t wait to see them in your rec room. I would love to build a few reclaimed wood pumpkins!